Rose Kretsinger was one of the 20th century's great quilt designers. Most of her work is in the Spencer Museum of Art at the University of Kansas. I have volunteered there for years to help with the quilts. 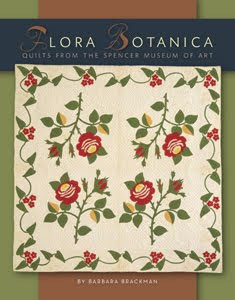 In 2008 we put a few of her quilts in an exhibit called Flora Botanica. 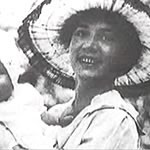 One was her "Democrat Rose", also called the "Antique Rose", dated 1926. I was surprised to see a pattern for Rose's rose in the January/February issue of McCall's Quilting. Rose Kretsinger's quilt is on the left, the model in McCall's on the right. Rose adapted a traditional pattern that is usually rather free and sprawling. She modified it to make it formally symmetrical. Careful repetition of the flowers was one key, but the most important innovation was a sashing with two flowers appliqued in each strip, creating a circular wreath design that catches the eye. You really can't make Rose's design in a block. You have to combine the block and the sashing. The magazine pattern shows you just how to do it. McCall's patterning a Rose Kretsinger quilt and not giving her credit is just karma. In the 1920s Rose redrew a McCall's Magazine pattern and didn't give them any credit. 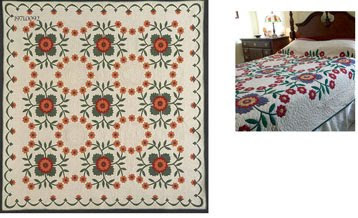 Below on the left: a McCall's pattern for an appliqued and embroidered design called "Trellis". On the right: a quilt in the collection of the Spencer Museum of Art by Ifie Arnold called "Morning Glory". 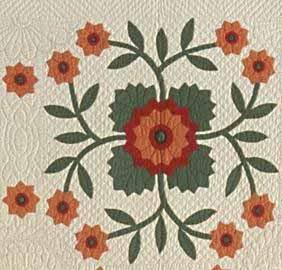 Ifie was a friend of Rose's and it is likely that Rose designed this quilt for her. Ifie made a pair of them. thanks for letting us know I will buy a copy of this magazine just for this pattern! A very informative post, thanks for sharing your vast knowledge of quilt history with us. Thanks for the information. Is there a more extensive biography or writings of Rose or perhaps of the women of Euphoria, Kansas? What a beautiful quilt and I love that orange shade, at least it looks nice on the screen. Dawn---Oh I wished it were called Euphoria, Kansas. That would be such a nice place to live. It's Emporia. You are the second person this month to ask about Rose so I made a bibliography. I'll post it as a blog entry in a few weeks so the links work. I spotted the design also. Can't remember when, but first noticed it on the cover of a Quilters Newsletter from June 1984. 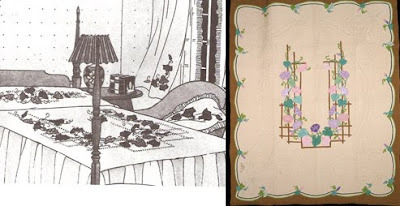 I was reading Marie D. Webster's Quilts Their Story and How to Make Them today (1/5/12) and between page 128 and 129 (1943 reprint of a 1915 copyright), there is an illustration of the Democrat Rose, made in Pennsylvania about 1843. There is no mention of who made the quilt. Thus, I found your page through searching the Web.